East Brunswick (N.J.) High School Head Coach Marcus Borden has been named the winner of the 2004 Power of Influence Award. Borden was nominated for the award by the New Jersey Football Coaches Association. The award, which is presented jointly by the American Football Coaches AssociationTM and the American Football Coaches Foundation®, will be presented to Borden at the AFCA Coach of the Year Dinner on January 11 at the 2005 AFCA Convention in Louisville, Kentucky. Borden will also receive a $1,000 stipend from the AFCF. The Power of Influence Award was created as a way for the AFCATM and AFCF® to honor a deserving high school football coach for his effect on his players, school and community. This award is not based on wins and losses, however, it is noted that coaches of powerful influence have longevity and success. It is the first AFCA award specifically designed to honor a high school coach. Borden is in his 23rd year as head coach at East Brunswick High School in New Jersey. He has compiled an overall record of 105-96-1 with five conference championships and seven playoff appearances. 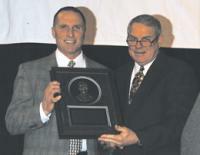 Borden has won five Coach of the Year honors and in 1991, he was honored with the New Jersey Gatorade Coaches Care Award. In 1997, he was inducted into the New Jersey Scholastic Coaches Association Hall of Fame. Borden's passion for football can be traced all over the state of New Jersey. He has served as the past president of the Greater Middlesex Conference and New Jersey Football Coaches Associations. Through his efforts, New Jersey initiated regular-season overtime in 1995 and expanded the playoffs in 1997. Borden is the creator and coordinator of the Super 100 All-State football team and banquet, the Greater Middlesex Conference Football Coaches Association Demonstration Football Clinic and the GMCFCA College Night, and the First and Ten Football Camp. In 2003, Borden was honored as USA's Most Caring Coach for his efforts in creating the Home News Tribune Snapple Bowl, which has raised over $130,000 for the Lakeview School for Cerebral Palsy and Children's Specialized Hospital since its inception in 1994. The other finalists were: David Buchanan, Mason County High School (Marysville, Ky.); Paul Costello, Hanover High School (Hanover, Mass. ); R. Shell Dula, Greenwood High School (Greenwood, S.C.); Paul Engen, Appleton North High School (Appleton, Wis.); Maurice Fitzgerald, Pearl-Cohn High School (Nashville, Tenn.); Dave Lawrence, Mattawan High School (Mattawan, Mich.); Travis Lee, Hot Springs High School (Truth or Consequences, N.M.); Kim Nelson, Sioux Falls Washington High School (Sioux Falls, S.D. ); Mike Rippee, Douglas High School (Minden, Nev.); Matt Senffner, Providence Catholic High School (New Lenox, Ill.); Don Shows, West Monroe High School (West Monroe, La. ); Jim Streety, James Madison High School (San Antonio, Tex. ); Rob Younger, Sweet Home High School (Sweet Home, Ore.). The AFCA was founded in 1922 and currently has more than 10,000 members around the world ranging from the high school level to the professional ranks. According to its constitution, the AFCA was formed, in part, to "maintain the highest possible standards in football and in the coaching profession" and to "provide a forum for the discussion and study of all matters pertaining to football." The AFCF, created in 2000, provides financial support for the educational goals of the AFCA.